PureH2O pure water is the environmentally friendly choice of drinking water; it means you can avoid single use plastic bottled water without compromising on taste, quality or convenience. Many people avoid tap water because they don’t like the way it tastes. We’re all familiar with the unpleasant, chlorinated taste of tap water! As a result, many people opt for bottled water – but the ecological impact of plastic (or glass) bottle production, transportation and disposal is huge. Bottles take a huge amount of water to produce (resource-degrading), many air miles to transport (pollution and carbon footprint) and then there’s safe recycling and disposal to think about. We have the eco-friendly answer: pure water. Our drinking water purifiers are typically installed in the cupboard under your kitchen sink. Day in, day out they take tap water and put it through an advanced purification process that produces drinking water of exceptional quality. Until you have tried pure water purified by the PureH2O CO. you don’t realise how bad other water tastes! I am a convert – no other water tastes this clean – even bottled water doesn’t come close. Deirdre Gough, director of Health Touch, London. 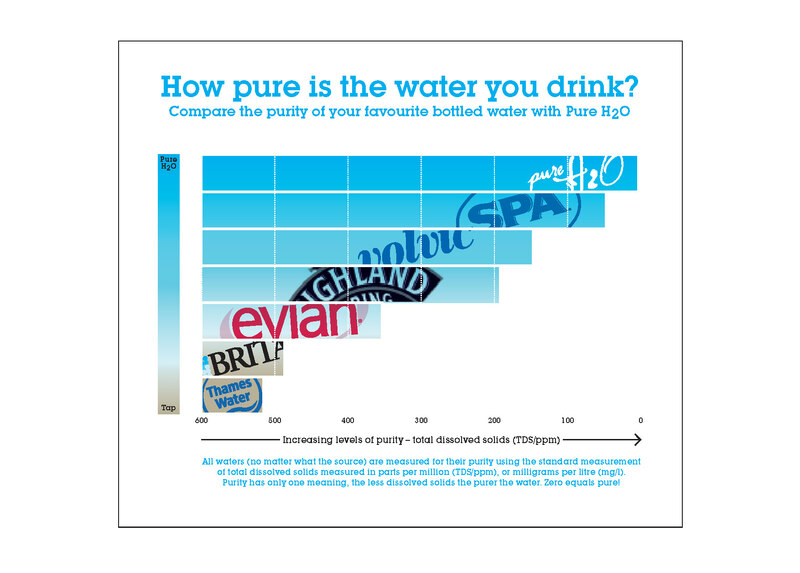 Did you know that pure water is purer by far than all bottled water brands? Quality is guaranteed by our 4-stage advanced water purification process that removes impurities and contaminants. Special membranes further guarantee water quality and a major advantage to our purification systems is that our membranes last longer than others on the market, ultimately saving you money (how does £100 a year sound?). Pure water isn’t just environmentally friendly, it’s a lot more convenient than plastic or glass bottled water, too. It’s on tap in your home as an unlimited supply, thanks to our efficient water purifiers. So you don’t have to lug heavy bottles of water home, find space for them in your fridge or cupboard and clutter up your recycling boxes with them, either. Don’t worry if sparkling water is your go-to for enjoyable hydration; bottled water isn’t the only option. 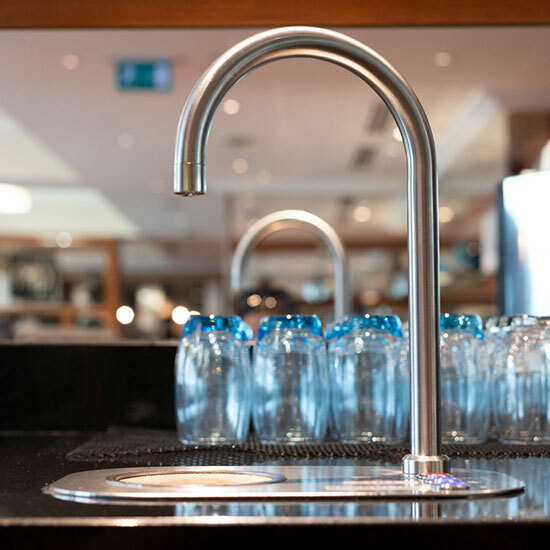 Our Quatreau collection of smart taps dispense sparkling pure water. What could be more convenient? Environmental concerns are at the heart of everything we do at the Pure H2O Company and we’re glad to be able to help you reduce your ecological impact by choosing pure water over bottled water. If you’re concerned about the environment, you’ll be glad to know that our pure water systems are energy and water-efficient and use recyclable components, too. You can view more details about our Purity collection of home water purifiers here. You can order online today. Please call us on 01483 617000 if you have any questions about pure water or would like to talk to our customer service team about which Purity model might be best for you. If you prefer, you can email help@pureh2o.co.uk.